You may be wondering why I am resurrecting a schmaltzy 1967 American rom-com movie, fifty years after we saw it on screens in India. True, it played on the theme of interracial marriage, so relevant in these days of “love jihad”. But that is not why I dwell on the guest who is coming to dinner. I am intrigued, and not a little amused, by the recent directive from the Prime Minister, no less, to his party MPs and Ministers to dine with Dalit families. That, more than seventy years after independence and after the enactment of a progressive Constitution that enjoins the virtues, among others, of equality and fraternity, elected representatives who represent all citizens, including its disadvantaged poor, have to be issued a firman to break rotis with those traditionally beyond the pale of the caste system is a telling commentary on the deep cleavages that still fissure Indian society. What strikes me as ludicrous is that those representing the people have to be told to interact with them. Recent months have seen stories of Chief Ministers, belonging to the dispensation ruling at the centre, eating at Dalit houses. We have been fed with salacious details of how plates, food and water were organised from outside so that the VIP could be captured on celluloid enjoying his victuals in the Dalit house. A very recent news report has detailed the elaborate exercise of a ruling party MP dining at a Dalit house. This former civil service colleague took to politics after a career in the civil services. I wondered whether he didn’t find this entire exercise unreal, given the interaction that civil servants get to have with all sections of society in the course of travels across villages and towns during their working years. From personal experience, my extensive travels across Maharashtra have taken me to tribal habitations, Dalit vastis and urban slums. I have been privileged to be the guest of poor families, who have shared tea (often without milk), poha and any other food item in the house with the unexpected guest. Many politicians I have known have also accepted food and drink readily during their tours, without bothering about the caste, religion or social status of their hosts. Which is why I find it inexplicable that a national political party finds it necessary to impose a diktat on its party men (and women) to interdine with members of a particular social group. Does this imply that, over the past four years, these peoples’ representatives have given the cold shoulder to the poor and disadvantaged, to the extent of not even visiting their humble dwellings and sharing chai-biskut with them? What I find more reprehensible are the accounts of apparently stage-managed dinners. 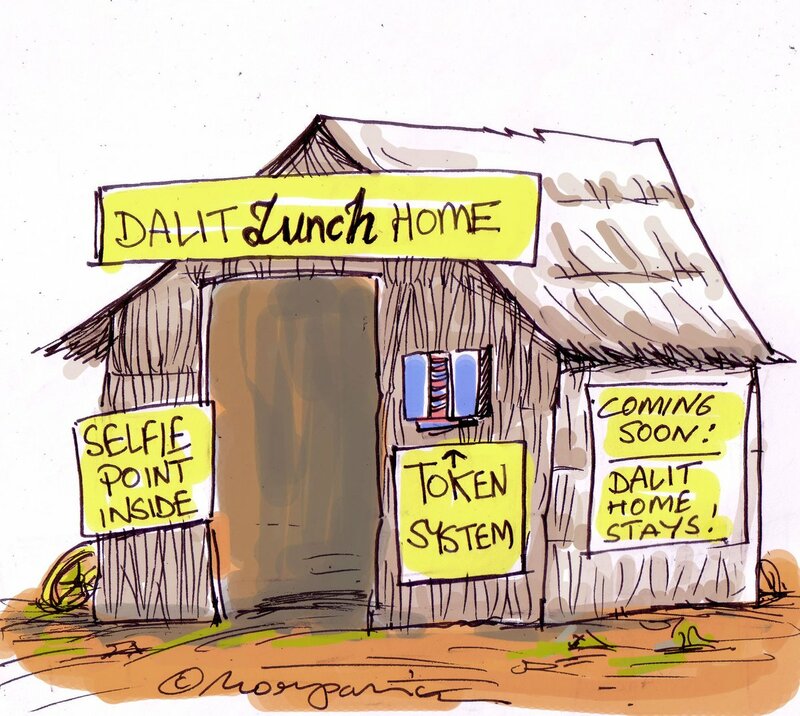 There have been reports of meals at certain locations being organised from outside the Dalit vasti, although the actual consumption by the VIP took place in a Dalit home. More to the point, the visits to the Dalit habitations, whether by a Chief Minister, Minister, MP or MLA, do not often see any tangible improvement in the living conditions of local residents, partly because of the poor governance and infrastructure systems in place and more so because of the lack of opportunities for benefiting from economic growth processes. That such publicised dinner visits reek of symbolism is one of the unfortunate spinoffs of such exercises, captured beautifully by the inimitable Hemant Morparia in a recent cartoon. While there are many sincere politicians at different levels, there is no denying that, in the race for one upmanship that politics, in India and elsewhere, has descended to, photo opportunities are used to advance ones’ reputation in the eyes of those who matter, especially in these days of Twitter, Facebook and WhatsApp. It would be extremely heartening if the visit by a Minister / MP / MLA was followed up with intensive efforts to address the shortcomings in delivery of public services that were observed during the visit. Unfortunately, such visits tend to be one-off instances, restricted to mentions in the press and reports to political superiors on one’s efforts, spectacle rather than substance. The other issue of concern is the widening gulf between the elected representatives and their electorate. Sighting an MP/MLA in the constituency between two elections is akin to spotting a black swan. Why, even getting to see the local corporator on the streets is a rarer occurrence than seeing a blue moon. MPs/MLAs, many of whom do not even regularly stay in the constituencies that elected them, have no system of judging the extent to which they are meeting the specific requests of their constituents (with honourable exceptions like Shashi Tharoor and Jay Panda). The result is a growing disillusionment and cynicism in the electorate, which looks to extract short-term benefits near election time, a dangerous trend in a democracy. Having reached the ranks of the senior citizenry some time back, I feel entitled to offer my two bits of advice to MPs and MLAs. Firstly, do try to leave your constituency looking somewhat better than when you first got elected. Insist on certain standards of efficient public service delivery, especially in the areas of health care, education and food security. It is saddening to see the ramshackle state of the public health services, ICDS and public distribution systems in constituencies that have been the pocket boroughs of particular individuals or families for years on end. Use technology to monitor processes and outcomes and develop a cadre of local youth who can facilitate the reach of basic services to the public, particularly the poor and disadvantaged. Secondly, please use your term(s) in elected office to meaningfully contribute to the passage of effective laws that improve the economic and social conditions of your fellow citizens. This will require less of rushing to the well of the legislature and disrupting business to drive home some inane political agenda. Let me assure you that the public is heartily sick of these shenanigans and, at the first availability of a suitable substitute, will boot you out of office. Thirdly, make it a habit to spend at least two or three days a week travelling to every area of your constituency. You have over 1800 days in office, enough to cover most villages and towns in your area. Drop in unannounced into homes, preferably in the late evenings, when you can meet with families and groups and share their joys and sorrows, as well as understand their grievances. Forget the meals, sharing a cup of tea, where you pour half the sweet concoction from the cup into a saucer and offer the latter to your host, will create a bond between you. Will this guarantee your reelection? Sadly not, elections are won and lost on a host of other considerations — religion, caste, emotions and money power. But you will have the enduring satisfaction of having participated in the lives of your less fortunate fellow women and men, giving them the strength to live another day, month and year to fight the ongoing battles of their lives.